As you may have gathered from our Code of Conduct, Ettin Con is all about players of all kinds getting together to share the games they love. With a mixture of introverts, extroverts, players from different neighbourhoods, social backgrounds, as well as age, ability and language differences, it can be easy to lose sight of our what we have in common, or how our experience of the event may vary from another's. With this in mind, we want to foster a community-mindful approach to the event. Conventions are a great opportunity to meet new players, and help those players meet you! It can also be very difficult for some attendees (or staff) to deal with the intensity of a public gathering, or to remember to rest, eat or hydrate appropriately. We'd like to reward attendees who keep these challenges in mind across the day, and make an effort to improve the event for everyone. Do you like badges? We like badges. You can choose one of these playbooks from our merch station, and tuck it into your nametag. Whenever you meet one of the conditions on the playbook, you earn some experience points. 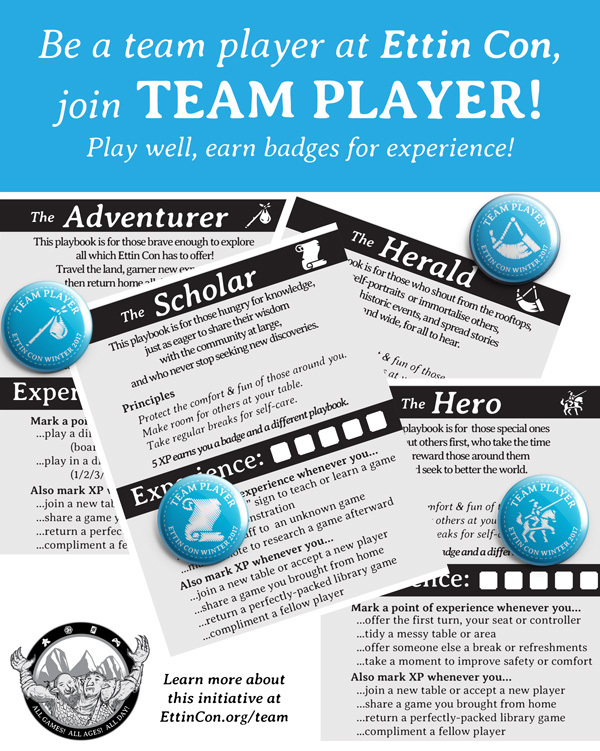 Earn enough experience points to complete the playbook, and you may then exchange it for a collectable badge! It's an honesty system, and badges are limited, so please play fair. This playbook is all about trying new things, in new places, with new players. This playbook is about sharing knowledge, because our hobby is deep, with plenty to learn and teach. This playbook is about helping attendees and staff enjoy the event safely. This playbook is exclusive to attendees willing to share their games with other library members. This is all about promotion, because we want everyone to hear about the fun you have when you visit! Some of our volunteers work beyond their rostered hours of their own volition. Some staff (and other supporters) buy spare tickets which we can give away free at the door for people facing financial struggle. This is something we also saw at GX Australia, which just happened here without us asking anyone to do so! Those who sign up to our Patreon page, or make any other generous donation via PayPal, the games library, or any other time, effort or equipment given to the association. If you have any ideas to improve this program, or any feedback at all, please let us know via either [email protected] or the feedback form at EttinCon.org/feedback. Show us that you can be a team player by joining Team Player because we're all on the same team, because we're all players!